Does Labor Actually Like Hillary Clinton? And how does she feel about labor? Until quite recently, the plant had been a point of civic pride, a holdout on a shorefront pocked with manufacturing ruins. But earlier this year, U.S. Steel idled large parts of the mill and laid off about 600 employees, most of its remaining workforce. Now, the rusting hulk looms over Lorain—population: 64,000—just behind a string of used-car lots, shot-and-beer joints, and boarded-up Polish and Slovenian social clubs. I had met Springowski a few hours earlier at a fundraiser for a local labor leader who was mounting an independent bid for city council. The TVs in the Derby Sports Bar and Grille were tuned to the Ohio State–Indiana football game; dozens of supporters—many of them union officials—were sporting Buckeye red and drinking beer from plastic cups. I was in northeast Ohio on a mission to find out how organized labor is feeling these days about Hillary Clinton. Seven years ago, Clinton captured a majority of union households in Ohio, en route to a 10-point primary victory against Barack Obama. In Lorain County, her margin was even more resounding: 57-to-41. At this fundraiser, however, skepticism toward Clinton was definitely in the air. Of the nine union members I interviewed, just one was supporting her. (Four were undecided, three were backing Bernie Sanders, and one was leaning toward Marco Rubio.) Some associated her with the unpopular trade policies of her husband. Others said she had been tainted by controversy, past and present. Most questioned her commitment to labor. In 2008, while campaigning in Ohio, both Clinton and Obama pledged to renegotiate the North American Free Trade Agreement—NAFTA may as well be a curse word in Lorain—and to cast a wary eye on future trade pacts. In the years since, however, Obama has repeatedly infuriated union members in places like Lorain: by championing the Trans-Pacific Partnership, which, in union parlance, is “NAFTA on steroids”; by instituting the so-called “Cadillac tax” on high-cost health care plans, the kind enjoyed by many union members; by failing to pass card-check legislation, which would make it easier for labor to organize. “I’m still a little suspect. I think she’s pandering to labor,” Adkins told me. Such are the complexities of Hillary Clinton’s in-some-ways-warm-but-in-other-ways-cool relationship with organized labor—a relationship I set out to document recently by interviewing about 40 union members in several towns in northeast Ohio as well as about 30 more in Nevada, another key state where organized labor looms large. (Clinton’s campaign declined to comment for this piece.) On the surface, Clinton and labor would appear to be strong allies. She would almost certainly be a more pro-union president than any of her plausible Republican opponents. And it’s therefore no surprise that at least 12 national unions have endorsed her. It’s also a near-certainty that she will win a majority of union voters next November. Yet look a bit closer, and the politics get cloudier. 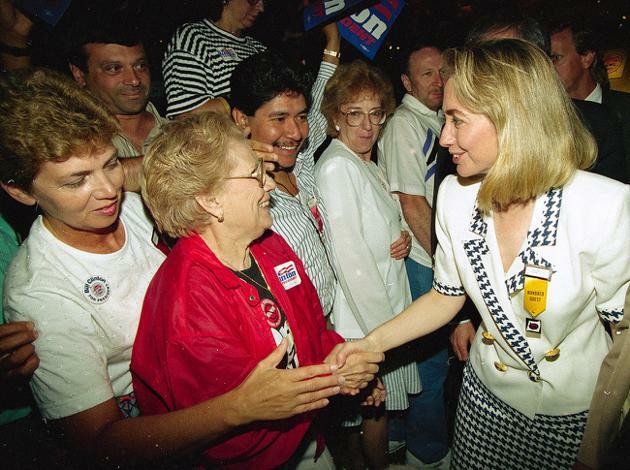 Clinton’s record on labor issues, stretching back many years, is contradictory and difficult to decipher, and organized labor is very far from universally enthusiastic about her candidacy. Sure, most union members will vote for her, but it’s still an open question whether she can gin up the excitement and decisive margins she will need next November among this important constituency. CLINTON'S FATHER, according to Carl Bernstein’s biography A Woman in Charge, was a staunch conservative who despised unions. But as Hillary grew up, she moved left on the political spectrum, and as a law student, she helped to expose the squalid living conditions imposed on migrant farmworkers. She also collaborated with union organizers to register Latino voters along the Texas border while working on George McGovern’s presidential campaign. BILL AND HILLARY'S years in the White House only further complicate the question of how she feels about organized labor. Among the biggest mysteries in retrospect: where she really stood on NAFTA. “My own recollection is that, in the 1992 campaign, when Gov. Clinton was trying to decide whether to endorse NAFTA, Hillary was more skeptical than others on our team,” Clinton adviser Paul Begala recalls. “So count her as a NAFTA skeptic.” Once Bill took office, Hillary was singularly focused on health care reform and, according to her chief of staff, Melanne Verveer, was frustrated that more centrist items—NAFTA and deficit reduction—initially consumed so much time on the president’s agenda. NAFTA came up again when Clinton was campaigning for the Senate in union-heavy New York in 2000. This time, she sounded a cautionary note, calling the agreement “flawed” and noting that it had originated in the first Bush administration. “We inherited an agreement, [and] we didn’t get everything we should have got out of it, in my opinion,” she said. Lorain’s U.S. Steel plant, before it was idled. 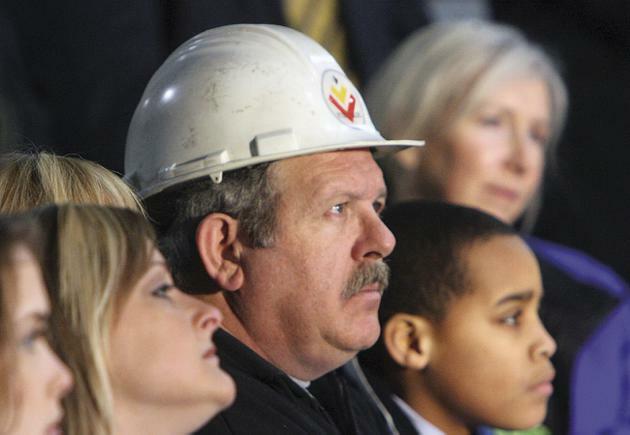 Audience members (left) listen to Barack Obama speak at a gypsum plant in Lorain, Ohio, in 2008. As a senator, Clinton co-founded the Senate “manufacturing caucus,” a bipartisan group of lawmakers who pushed to preserve the country’s dwindling manufacturing industry. On trade, she took a nuanced approach, informed, she would later say, by a study she commissioned on the effect of NAFTA on New York businesses, particularly farmers, who found it difficult to export their products to Canada. While Hillary ultimately voted for a series of small trade deals—saying in 2005, “I believe that properly negotiated trade agreements can increase living standards and foster openness and economic development for all parties”—she opposed the Central American Free Trade Agreement, which Bill publicly supported. Speaking on the Senate floor, she cited weak labor and environmental standards, and said the pact did not contain provisions to help American workers who lost their jobs. Later, as with the battle over NAFTA, the TPP saga seemed to bring out some stark contradictions in Clinton’s instincts on trade and labor. While serving as secretary of State, she said that the deal “sets the gold standard in trade agreements”; then, in her 2014 memoir, she wrote that, while she was optimistic about TPP, “it makes sense to reserve judgment until we can evaluate the final proposed agreement”; and last month, she announced her opposition to the deal. THE HOSTILITY TO TPP I heard in Ohio—the third-largest manufacturing state in the country—made clear just how imperative it was for Clinton to eventually come out against the deal. “She’s been very, very cagey about it, and that scares our members,” Jose Arroyo, a staff rep for the United Steelworkers, told me in early October. I’d met both Arroyo and Strickland at an event at McMenamy’s Restaurant in Niles, a working-class city of 19,000. There, in the mirrored banquet hall, hundreds of union officials had gathered for the annual fundraiser of the Mahoning-Trumbull AFL-CIO. Most wore suits, though some donned bright-yellow union T-shirts over their button-up shirts. Without much prompting, many labor leaders I spoke to readily ticked off a list of grievances with the Obama administration—TPP, card-check, the Cadillac tax, new environmental regulations on coal. OF COURSE, the views of union members in one particular state or one particular industry aren’t necessarily representative of union members everywhere. Consider Nevada. Like Ohio, it’s a swing state where union voters will play a key role next November. But in stark contrast to Ohio’s relatively white unions, Nevada’s service industry is heavily Latino. (More than half the members of the powerful Culinary Union—which represents 55,000 casino workers in Las Vegas and Reno—are Latino.) This means, for one thing, that immigration is a key issue alongside other labor concerns like trade. It also gives a built-in advantage to Clinton, who, in general, fares better among Hispanic voters than she does among whites. In 2008, the Culinary Union officially endorsed Obama. But Clinton’s campaign spent months organizing the casino workers, and in the hours before the caucus, Bill Clinton hopscotched from casino to casino on behalf of his wife. In the end, Hillary won the majority of caucus sites on the Las Vegas Strip, which were heavily populated by Culinary members. And she won Nevada, taking nearly 51 percent of the vote, compared with Obama’s 45 percent. IT ISN'T JUST on the ground in places like Ohio and Nevada that one hears divergent opinions within organized labor about Clinton. That same split—between purists and pragmatists—is playing out at the leadership level as well.